In the heart of Barcelona's winding alleyways, Daniel Sempere runs the Sempere & Sons bookshop - a place of refuge for booklovers and wandering souls. Married and with a young son, Daniel is still haunted by the strange rumours surrounding his mother's death. One night, he dreams he is standing in The Cemetery of Forgotten Books, a secret library of forgotten titles known only by a few. There he finds a white coffin containing the body of his mother. As he reaches towards her, she utters the words "You must tell the truth, Daniel". Aided by his trusted friend Fermin, Daniel realises he must lay her ghost to rest. It is a journey that will take him back deep into the past. To a young girl abandoned amid the wreckage of the civil war. To a wealthy government minister tormented by an anonymous blackmailer. To the secrets behind a series of prohibited books called The Labyrinth of the Spirits. And at the heart of the enigma is Alicia Gris, born in the shadows of the war, who holds the secrets to the family's past. 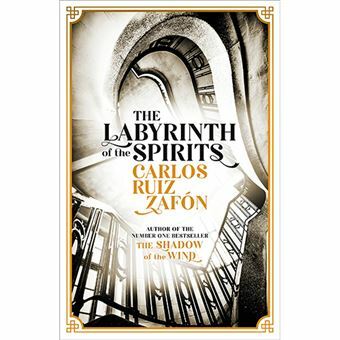 An electrifying story of passion, intrigue and adventure, The Labyrinth of Spirits is a Russian doll of a novel, of plots within plots, where even the shadows have a story to tell.